Dalkey Quarry is a long disused 19th century granite quarry located on Dalkey Hill in the Dublin suburb of Dalkey, which has become one of the most popular rock climbing locations in Ireland, with over 350 routes, some of which are amongst the hardest single-pitch rock climbs in Ireland. Quarrying started in 1815–1817 on Dalkey Hill in order to supply granite for the construction of the new harbour pier at nearby Dún Laoghaire, as well as for the construction of the South Bull Wall (part of the outer defences of Dublin Harbour) and as flagstone for Dublin streets. In the 1840s, stone from the quarry was exported to Newfoundland by Bishop Michael Fleming and used in the construction of the Basilica of St. John the Baptist in St. John's. The quarry was connected to Dún Laoghaire by a light railway, part of whose alignment was later used to build the Dalkey Atmospheric Railway. The remaining part of the route is now a public footpath known as The Metals, and much of the original granite paving survives. A number of the houses on nearby Ardbrugh Road may have been originally built as quarry staff cottages, though most quarrymen originally squatted or lived in primitive tents. Quarrying continued sporadically thereafter, finally ending in 1917. 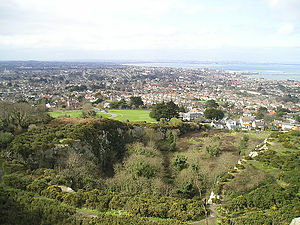 In 1914 most of the land was added to the existing Killiney Hill Park, opening it to the public. In 1998, the local authority which owns the land drew up proposals to turn the quarry's west valley into a caravan halting site for travellers. The move met with opposition from local residents, climbers, and environmentalists, and the plans were eventually dropped. In May 2010 Dún Laoghaire/Rathdown County Council angered climbers when they removed several large boulders from the quarry, disrupting climbing routes and potentially damaging other climbing routes in the process. Layout and access of Dalkey Quarry, showing the East Valley, West Valley, and Upper Cliffs area. The quarry is laid out in three main climbing sections. Off Dalkey Avenue lies Ardbrugh Road, above which give access to the three valleys of Dalkey Quarry (there is no access via Cunningham Drive). The Far East Valley is private property, occupied by a small "gated community", and closed to climbing; the East Valley Climbing Area which contains a number of climbs; and the West Valley Climbing Area, which also contains climbs. Between the East and West valleys is a broad ridge along which the quarry railway used to run; this is used to gain access to the Upper Cliffs (or Tier) Climbing Area, which contains the quarry's highest cliffs. The Upper Cliffs is traversed by a tarmac path leading to the Killiney Hill car-park at one end, and a set of steps leading to the top of the hill at the other end; the path and steps are popular with strollers. The hilltop path follows a wall which skirts the top of the cliffs, and passes an old signalling tower which was used by the British military to signal to the neighbouring Martello towers during the 19th century. Central Buttress on the Upper Tier, home to the quarry's longest routes and some of the hardest. A selection, left to right: Slapstick (E7/6b), Central Buttress (E1/5b), Portcullis (E4/6a). The old signalling tower is visible at top left. Apart from the one path and steps, the quarry is not landscaped but is left wild; as a result, it is forested, with gorse and bramble growth. It, therefore, less resembles a typical industrial quarry, and looks more natural. The vegetation is home to wildlife – including foxes. In recent years,[when?] peregrine falcons have nested in the cliffs of the upper tier; climbing in the vicinity of the nests is banned during the nesting period. In 1942, the quarry's first recorded climbs were made by members of the Irish Mountaineering Club (IMC), and a handwritten guidebook was published. These were the first steps in the development of rock climbing in Ireland; many of those first climbing routes remain in use by today's climbers. Throughout the following decades, clearing of vegetation and loose rock by an increasing number of climbers uncovered more climbing routes, and improvements in climbing techniques and equipment increased grades. The latest guidebook, published in 2005, lists about 300 routes, at grades up to E7. The online guidebook contains over 350 routes with grades to E8 6c, Indecent Assult. The number and density of routes in Dalkey Quarry is high given the size of the quarry (e.g. Fair Head's 5 kilometre-long cliff has circa 450 routes, and Ailladie's 1 kilometre-long cliff has circa 200 routes), however, it is due to its position as the most accessible outdoor rock climbing area for the entire city of Dublin. Dalkey quarry routes are almost all single-pitch, between 10m and 35m in length. Routes vary in nature, with steep finger-cracks and bare slabs featuring prominently. Being granite (with some bands of quartz), friction is usually good, but being quarried, not as good as fully weathered granite. Protection varies but is generally good; in accordance with local ethics, there are no bolts on any climbs in the quarry, and the few remaining pitons are rarely replaced when they break. Browner, Ronan; Hebblethwaite, Howard (2005). Dalkey Quarry Rock Climbing Guide. Mountaineering Ireland. ISBN 978-0902940208. Flanagan, David (2014). Rock Climbing in Ireland. Three Rock Books. ISBN 978-0956787422. ^ Pollock, J. (2004). Geology of the Roman Catholic Basilica of St. John the Baptist, St. John's, Newfoundland. Geoscience Canada, 31(1), 10-Jan.
^ "New halting sites law for Irish Travellers". European Roma Rights Centre. Retrieved 2009-12-07. 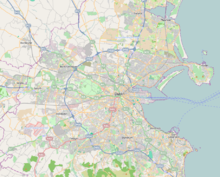 ^ "Dalkey Quarry action criticised". Irish Times. 2010-05-05. ^ a b "Dalkey Quarry, Dublin". UKC Log. 23 November 2007. The word 'quarry' can often turn some people off (hope you got this far! ), me included, but Dalkey is much more appealing than most. It's very green at the base, in fact it's like a maze of narrow paths, and some points taking you through head-high gorse. The rock type is granite, so makes a change from the quarries in this country, which in my experience are predominantly limestone, grit or slate. It's pretty large being split into three areas (West Valley, East Valley and Upper Tier) and also has a huge variety of routes – slabs, cracks, chimneys, steep blocky overhangs, you name it. ^ Paddy O'Leary (2015). "The Way That We Climbed". The Collins Press. ^ a b "Dublin Rock Climbing: Dalkey Quarry". Hike & Climb.